1944 began as a continuation of the career Bela Lugosi had enjoyed through the early 1940s. In the early part of the year, he toured for three months in Arsenic & Old Lace. Before and after the stage tour, he starred low-budget films for Monogram (Voodoo Manand Return of the Ape Man). He was so busy that he had to pass on playing Dracula in Universal’s House of Frankenstein. John Carradine played Dracula in that movie, and co-starred with Lugosi in the two Monograms. Both studios now turned to Carradine for roles that might have gone to Lugosi. Lugosi would never work for Monogram again, and would only work once more for Universal, in 1948’s Abbott & Costello Meet Frankenstein. In the second half of 1944, Lugosi played only a secondary role in One Body Too Many. He did end the year filming Zombies on Broadway. Lugosi probably did not imagine that undead-obsessed Dr. Renault would be his last mad doctor of the decade. Movie-going tastes were changing, horror films were becoming passé, and the major studios were all but through with Lugosi. The next few years would be financially difficult as work slowed to a trickle.The growing tensions between the Lugosis is surprisingly evident in one of his stage tour interviews (April 9, Philadelphia Record). In the summer of 1944, Lillian filed for divorce, but reconciled a few months later. In his one statement to the press, a jubilant Lugosi accepted all blame. Your old horror fan dusted off his best scream and shiver, filed a new edge on the teeth, and went up to see Dracula Friday. He thought it would be nice to pick up a little lesson in biting. I never wanted to sing like Frank Sinatra, or make love like Clark Gable, but man, oh man, if I could only bite like that boy, Dracula, my wall flower days would be over. I never could do parlor tricks or answer riddles at social gatherings, but no longer would I blush with shame when folks tittered at my shortcomings. I would simply saunter over and bite the hostess on the neck in a Dracula manner. If you don’t think I would immediately become the life of the party—certainly a card, as the saying goes—then you never saw Dracula. Or, on the other hand, you never saw me bite a hostess. Not only that, but what with the sirloin shortage what it is, anything new along this line that don’t take ration points might come in right handy before the winter is over. As I tiptoed into the Biltmore, I expected to find beautiful blondes scattered all over the corridor. Well, you can just imagine how I felt when I burst in his room and found that strange, half-human, half-bloodsucking vampire lying there on the bed with his evil eye fixed on a lovely delicate little—postage stamp. Yes sir, the terrible Dracula turned out to be a stamp collector. Also, he was wearing red suspenders, his eyes were a mild, kindly blue, and his long smooth-brushed hair was streaked with a middle-aged gray. He could have been somebody’s father. Dracula, who also is known as Bela Lugosi, collects stamps everywhere he goes. When he isn’t doing that, he is reading and hiking. Strange relaxations for him, it would seem, until one realizes that a man who makes his living working as Dracula year after year wouldn’t get a whale of a kick out of playing post office on his nights off. When he’s home, his big fun comes from playing with his 6-year-old son. “You wouldn’t believe it, but he is already imitating me,” Lugosi beamed, acting just like a father. Lugosi also smokes cigars that have had the nicotine taken out of them. He likes, he says, green salads, raw fruit, no sweets, orange juice and milk. It’s pretty nice being a horror specialist, in lots of ways. Lugosi, veteran Hungarian actor, played romantic leads and character roles for 20 years in Europe and in America until 1927 he created Dracula. It brought him international fame. Now folks no longer want to see him as a great lover. They want to scream. It would all be pretty sad and his and his professional heart would be heavy, except there is pretty good dough in making folks scream. From a discussion of art and culture, things moved on to the subject of dinner. “I sure would like a good rare steak,” he said, forgetting all about the green salad and raw fruit, the Dracula apparently coming out in him. “And would you like to come by my room first?” he continued, forgetting about all the milk and orange juice. Bela Lugosi, the Dracula man, had a little trouble with his shopping Monday. After playing in Arsenic & Old Lace at Tulsa, Lugosi and cast had a one-day layover here while en route to Little Rock. Lugosi joined the company for his first performance Saturday afternoon. As Jonathan, the fugitive from a hospital for the criminal insane, he was supposed to look a bit shabby, but didn’t have time to get a suit to go with the part.Monday he made a tour of city pawn shops with Jim Boyle, local manager, and Victor Sutherland, stage manager of the company. He bought an aged, blue, shiny suit, and a second-hand black hat and an old pair of shoes. The shop operator thought he had a real mental case on his hands when Lugosi refused to look at his “better merchandise.” The veteran stage and movie star insisted on a suit two sizes too large, in order to provide a proper bag. Then he carefully tied the new suit up in a knot to give it wrinkles. Just as the group started out, Lugosi turned his finest horror stare on the shop operator and gazed for a half-minutes. The poor man just about jumped out the windows. “Actors are funny people,” he said later, after learning the identity of his customer. To top the day off, Lugosi and Mrs. Lugosi spent the night on a chair, en route to Little Rock. P.S. It was their 12th wedding anniversary. Fame is the goal of virtually every actor, yet fame has proved a liability to Bela Lugosi, star of Arsenic & Old Lace, the sensational laugh and thrill hit coming to the Lanier Auditorium Thursday at 8:30 p.m. Prior to scoring a nationwide hit in Dracula, Mr. Lugosi was a romantic actor on the stage. He was constantly at work because there are more opportunities for lovers than for mystery men. But now he is a “marked man.” Unless a playwright unfolds a plot including the supernatural, the mysterious or the horrible, Mr. Lugosi must sit at home twiddling his thumbs. I was natural, therefore, when the role of Jonathan Brewster in Arsenic & Old Lace was available, that Mr. Lugosi was the man, because this particular character is the most menacing figure seen on the spoken stage in many a year. “People approach me somewhat fearfully,” he said recently. “Girls running elevators have been known to stay home when I visited certain towns. But when they learn that I am just a human being and not a demon, they seem to be unpleasantly surprised.” Lugosi has played romantic roles for years, first in his native Hungary and later in the United States. He came to this country as a leading man in The Tragedy of Man, a famous Hungarian classic. At that time he could not speak English, but diligent work covering several years of study made him proficient and when his big opportunity came in Dracula he was not only ready but something of a sensation. Since then he has appeared in many motion pictures such as White Zombie, The 13th Chair, Chandu the Magician and others. Last season Lugosi toured the country in a stage version of Draculaand this season he has been appearing with great success in the star role of Arsenic & Old Lace supported by the New York company. Tickets are now on sale at the Jesse French Piano Company, where the box office is open from 10 to 4 pm. She was a beautiful Hungarian actress, the toast of yesterday’s Continent. Her hair was pale brown and her skin a ghostly hue. The strange light in her eyes seared and scarred the soul of the man she adored. To this day, Bela Lugosi, her victim, has never decided whether the mark she put upon him was lucky or unlucky. It has worked both ways. To escape her spell Lugosi fled from his native Hungary and forfeited the right to wear Romeo’s velvet breeches. That was bad. But pain wrote lines into his handsome young face and Broadway gave him the title role of Dracula. That was good, because it won for Lugosi a lifelong lease on horror man assignments. The 20-year old curse put upon Lugosi by his too ardent admirer had been exceedingly profitable. But only a moan of Lugosi’s determination could have survived the wear and tear. Horror hounded him—on and off stage and screen. Even today, safely married to his fourth wife and the proud parent of a robust son, Bela must fortify himself against the lady’s spell by arising at dawn, walking his ferocious dogs 10 to 12 miles, partaking of no solid foods until sunset, and guarding against all evil influences—natural and supernatural—with a huge wall that surrounds his home and private arsenal. Lugosi doesn’t scare easily, he’ll tell you. But even an intimate acquaintance of vampires, zombies and spooks can’t help a man with a curse upon him. Look at the facts. Since the day Lugosi spurned the lady with the ghostly skin, he has been gassed, wounded and shell-shocked. Political enemies have threatened his life. The ship in which he fled to America almost sank several times, and he had had three ill-starred marriages. Often he has tried to break the spell. Once, he even shackled a wife to a 5th Avenue bus bench –but he couldn’t stop her from going to Reno. Two other wives also talked to a judge, despite his pleadings—sometimes even made in false whiskers. The current Mrs. Lugosi, a pretty young woman who was once his secretary, seems to have broken the charm—at least so far as marriage is concerned. Maybe it is because she usually accompanies her husband on tour, seeing that his shirts are properly washed even if she must wash them herself. “It’s fine to hear people laughing for a change. It’s such a relief to be playing Jonathan Brewster after all those horror roles,” says Bela (Dracula) Lugosi. Jonathan of Arsenic & Old Lace is a delightful character—a gentle soul who performs murder only 12 times during the three act play at the Locust St. Theatre. In the movies, Mr. Lugosi never had a chance to engage in such merriment. He goes around on the screen flapping that long cape, making two little holes in the necks of beautiful girls, sucking their blood and getting spikes pounded through his heart. He has been dead, a member of the “undead,” a vampire, monster, wolfman or, at best, a spook in 50 or 60 films. He has killed off three or four times as many people—mostly lovely young girls. And to think he began his career as Romeo. For 20 years before Dracula he played romantic and other leading-man roles—Liliom, Hamlet and such on stage roles in Europe. Then one appearance as Dracula stamped him overnight as a specialist in horror and he hasn’t been able to break away. In spite of 18 years of celluloid blood-sucking, offstage he’s just like you and me—except for such little peculiarities as drinking stale, cold coffee before a performance and having his drinking water imported from his native Hungary—sulphur water which even he admits tastes like rotten eggs and which is about finished. Outside of this, eating lunch at the Barclay is like eating with anyone else—only pleasanter. His fourth wife and former bookkeeper, Mrs. Lugosi is young, pretty and very much wrapped up in her husband and his career. She keeps all his scrap books, check books and it was she who began his 150,000 stamp collection by saving the stamps on letters from foreign fans. Both the Lugosis are avid readers—he six to eight hours daily, reading which includes almost exclusively sociology, economics, history, geography and astrology—that’s right astrology. His good friend is Manly P. Hall, of Hollywood, an astrologist who predicted correctly the year day and hour of birth of his son, six year-old Bela, pronounce “Bayla.” Mrs. Lugosi likes detective stories. “We were terribly disappointed about The Lodger, she said. “We wanted to play it.” She has no screen or stage ambitions for herself. Wounded in World War I after three years in the trenches, he later fled Hungary as a political refugee, escaped to Vienna, Berlin, Italy and eventually the United States, as assistant engineer on a freight boat. He became a citizen in 1930. Most of his free time since then has been spent for humanity—Hungarian humanity especially. He is national president of the Hungarian-American Council for Democracy, the central organization of Americans of Hungarian descent behind the war effort of our country and at the same time helping the people of Hungary in their fight against the Nazi-Fascist oppressors. Bela Lugosi has made a career and a fortune as a horror specialist. The tall, dignified Hungarian-born actor for years has been one the foremost stars of the chiller-thriller and Whodunit movies. In the Hollywood vernacular, he’s a “super-creep,” a “top zombie.” To millions of addicts of the fright and fantasy films, Dracula, the blood-sucking vampire, and Bela Lugosi are one and the same. The actor Lugosi is sincerely grateful to this loathsome creature. It was his performance in the title role of the playDracula which overnight lifted him from relative obscurity to Broadway preeminence and the film version made him a screen star. Since his initial triumph as a horror performer he has played with singular success a fearsome array of the most amazing and shocking characters that the imaginations of Hollywood script writers have been able to devise. He has been vampire and bat man, monster and murderer with but rare breathing spells. 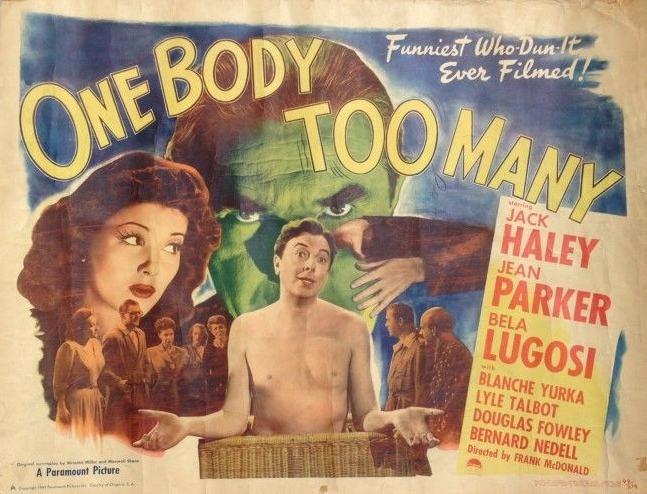 And Lugosi is at it again in his current role in Paramount’s One Body Too Many, the eerie murder mystery which producers William Pine and William Thomas are making with Jack Haley and Jean Parker sharing stellar honors with Bela. He portrays a strange-acting and sinister-looking household servant who from his first appearance is under suspicion of the audience, as well as by almost everyone in the east. But like the popular comic whose burning desire is to play Hamlet, Lugosi has a deep yearning to change character. He knows that he has been indelibly stamped by the moviemakers as a fright star. The Dracula role which brought him fame at the same time typed him in Hollywood. It became a Frankenstein which inexorably dictated to the casting office the type of toles that Lugosi was to be given. He calls it “The Dracula Curse.” Lugosi wants to play straight character leads in pictures. His hope and ambition is to “look and act like a normal human being.” “I’d like to be liked for a change,” he declares. Lugosi has not always been a maestro of the macabre. In fact, he played straight roles for 20 years. As one of the leading members of the Hungarian National Theater he was a dramatic star, whose repertoire included Shakespeare and the Continental classics, as well as modern plays. On Broadway he was making a name for himself in straight dramatic roles before Draculacame along. Even in Hollywood he has had a few welcome departures from horror characterizations. He did straight parts in such pictures as Ninotchka, The Saint’s Double Trouble and The Gorilla. But a revival of public appetite for spine-chilling screen fare launched a new cycle of horror dramas and put Bela Lugosi back into the business of scaring people. Lugosi prudently does not contemplate divorcing himself completely and irrevocably from horror roles at the start. That would be bad business and bas showmanship, he believes. But he would like to make straight dramatic portrayals gradually his principal occupation. However, his plans for a change in acting pace will have to wait for a while longer. As soon as he finishes his work before the camera in One Body Too Many, he goes on the road in the stage hit, Arsenic & Old Lace, taking over the role of Jonathan Brewster, the mad murderer. He replaces a fellow horror specialist, Boris Karloff, who is returning to the Hollywood sound stages. Hollywood (AP)—It has taken Bela Lugosi a long time to live down the success he achieved in his first big stage and film roles, and he almost went bankrupt in the process.Never has an actor become so indelibly identified with a single role as Lugosi with his part of Dracula and never has a role so completely dominated an actor’s fortunes. TheDracula role lifted him from relative obscurity and made him a figure of importance on the New York Stage. Within two years it elevated him to stardom on the screen. Draculablotted out all of Lugosi’s previous achievements in the theater, including Shakespeare and Ibsen and romantic leads and character roles of all types. His fortunes rose with the popularity of the horror character he had created. Rose, at least, until such films were barred in England and Hollywood ceased making them. Lugosi’ fortunes crashed. A few years passed by before a small independent exhibitor experimented with a revival ofDracula. It was a sensational success. Universal pictures began again making horror films, and Lugosi was back as a star again. But this time Lugosi was aware of the Draculainfluence. He set up barriers against it. He won a straight character role in The Gorilla and in Ninotchka with Greta Garbo. Then came a straight heavy role with The Saint’s Double Trouble with George Sanders. 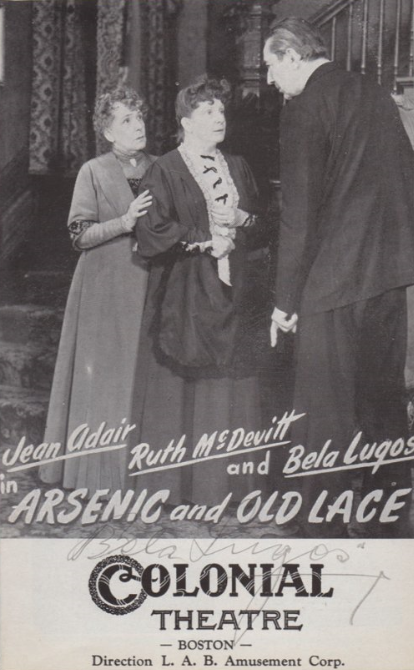 In 1934 Lugosi won the role of Jonathan Brewster in Arsenic & Old Lace. He was praised and went on tour with the play. Now he’s back in Hollywood, and his first screen part is that of a half-crazed scientist in RKO Radio’s Zombies on Broadway. It’s a straight character role, divorced from the influence of Dracula. Hollywood (AP)—One of the screen’s high-powered horror men, Bela Lugosi, has won back the affections and esteem of the wife who left him several months ago. Lugosi said Saturday they had become reconciled and that her divorce suit is to be dismissed. “I have courted her with flowers and candy ever since she walked out,” Lugosi said, I’ve been shaving regularly. That was one of our troubles. I was a careless husband; as a European I expected things too much my own way in the home. American girls don’t like that. They want things more 50-50.” The Lugosis were married 11 years ago and have a six-year-old son, Bela, Jr.